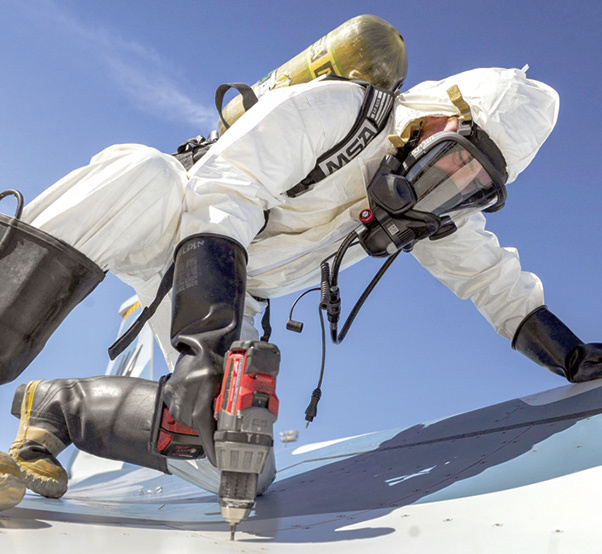 A Mission First Support Services biohazard engineer checks the panels of an F-16 Fighting Falcon during the MARE at Nellis Air Force Base, Nev., Oct. 13. The MARE tested the ability for the participating units to respond after a simulated aircraft crash. 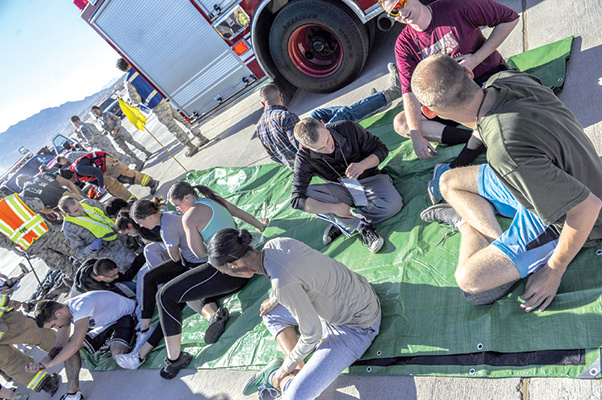 NELLIS AIR FORCE BASE, Nev. — On, Oct. 13, Nellis AFB conducted an exercise to evaluate real world response capabilities of emergency personnel for scenarios that could impact the base. Some of the participants included the Wing Inspection Team (WIT) members, Scene Controllers for additional safety, and volunteers simulating victims and witness to the incident. The Major Accident Response Exercise (MARE) was used as a learning tool for responders, providing feedback for processes to improve on. 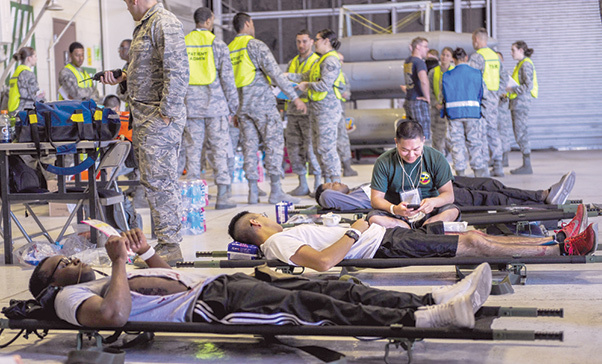 Simulated casualties lie on stretchers in a hangar during the MARE at Nellis Air Force Base, Nev., Oct. 13. The exercise took place to test the participating units ability to respond to an on base emergency. 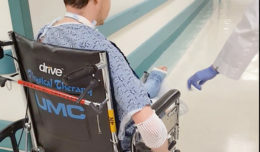 Airman Paul Morss and Airman 1st Class Wade Alfson, 99th Security Forces Squadron security forces members, help a simulated casualty to her feet during the MARE at Nellis Air Force Base, Nev., Oct. 13. The 99th SFS being the first on-scene of an emergency situation on base, has a wide range of responsibilities, including securing the scene and taking care of injured. 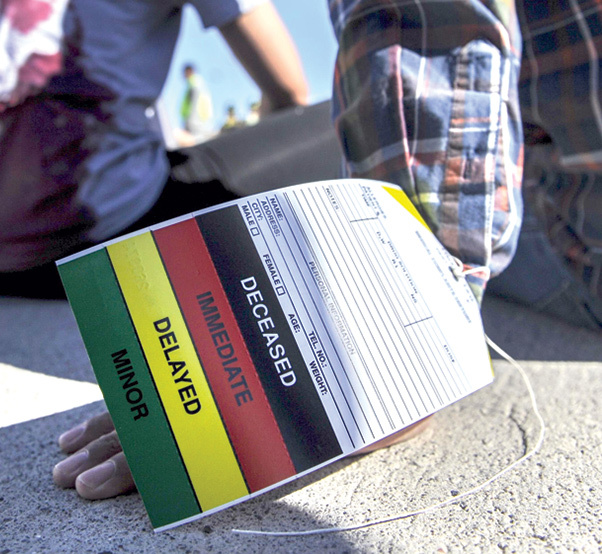 A patient wears a triage label on his hand after a simulated aircraft crash during a MARE at Nellis Air Force Base, Nev., Oct. 13. The exercise will be used for educational purposes and will provide feedback on the areas the participating squadrons excelled in and what areas that could be improved on. 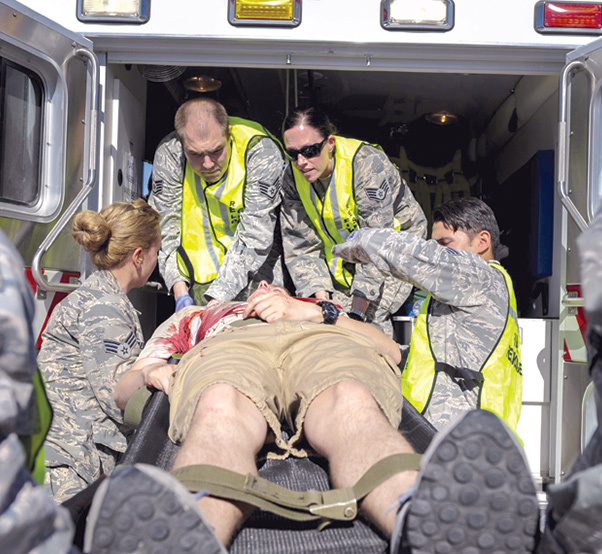 The 99th Medical Group emergency responders load a simulated casualty into an ambulance during the MARE at Nellis Air Force Base, Nev., Oct. 13. The MARE objective is that the Airmen participating will learn new ways to overcome shortfalls and enhance their unit. 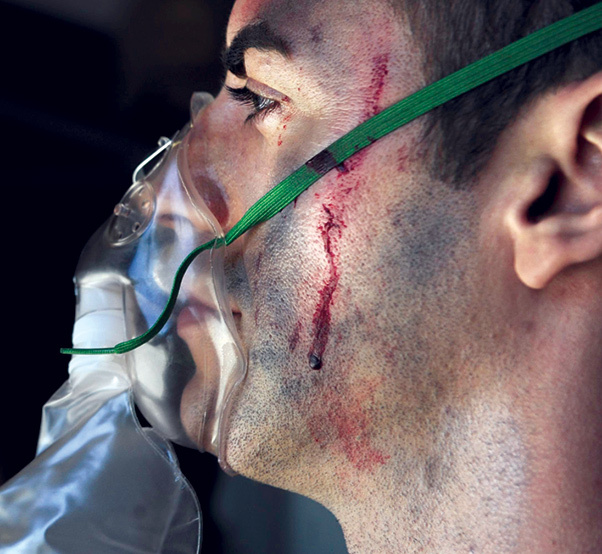 A simulated casualty breaths into a mask in a hangar during the MARE at Nellis Air Force Base, Nev., Oct. 13. The participants included Wing Inspection Team (WIT) members, Scene Controllers for additional safety, and volunteers simulating victims and witnesses to the incident. 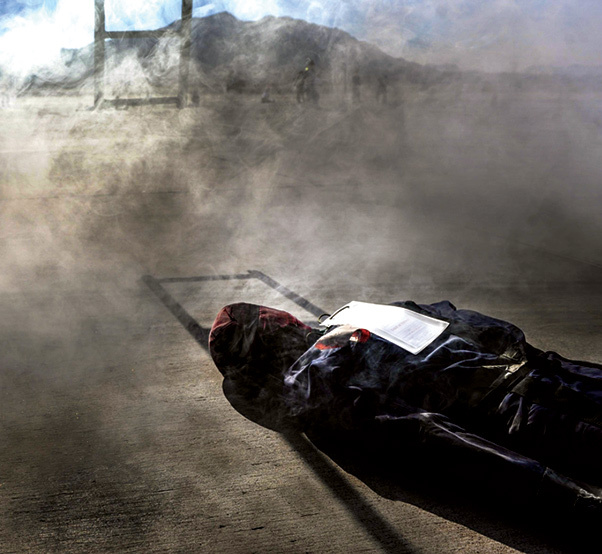 Simulated casualties are triaged after being moved from the scene of an aircraft crash during the MARE at Nellis Air Force Base, Nev., Oct. 13. The MARE will be used as a learning tool to provide feedback on what went right and what areas could be improved on. A simulated casualty lies underneath an F-15 Eagle during the MARE at Nellis Air Force Base, Nev., Oct. 13. 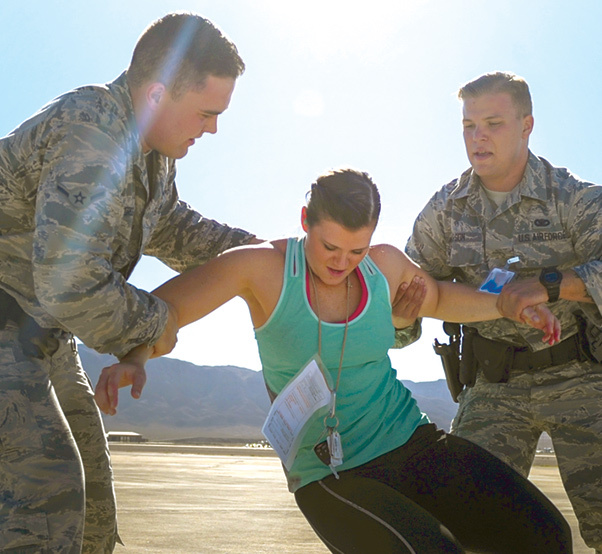 Nellis AFB conducted the exercise to evaluate real-life response capabilities of emergency personnel for scenarios that could impact the base.